Following Joe Biden’s announcement that he would not run for president, public pronouncements and media coverage have been more hagiography than biography. The praise has been so over the top, you’d think Joe had died and gone to heaven and folks were delivering cloying funeral orations. Before the Democrats and the media canonize Joe Biden, let’s step back a bit. The most consistent element of the comments has been the assertion that Joe is a great and good man because of his unquestioned honesty. In his 1988 campaign for the Democratic Party’s presidential nomination, Biden gave a speech that drew the attention of New York Times columnist Maureen Dowd. She accused Biden of outright plagiarizing speeches given by British Labor Party leader, Neil Kinnock. As it turned out, not only did Biden lift text from Kinnock’s speeches; he even appropriated parts of Kinnock’s life, citing his ancestors’ ability to read and write poetry, his accomplishment of being the first in his family to attend college and, in an apparent effort to show his blue-collar roots, that some of his ancestors were coal miners. That was all true for Kinnock, but most certainly not for Biden. Biden’s problems escalated when media discovered that he had also exaggerated his college academic record and been accused of plagiarism there. Biden claimed that he’d finished Syracuse Law School in the top half of his class when he’d actually graduated 76th of 85. He’d also and gotten an F in a law school class for plagiarizing a substantial portion of a paper from an article in the Fordham Law Review. Biden dismissed the plagiarism incidents as “much ado about nothing,” but subsequently ended his campaign. Like so many politicians, Biden also has not shied away from rewriting history. Remember when Hillary Clinton claimed she was threatened by sniper fire when she visited Bosnia in 1996, an assertion that was later disproved? Biden once claimed that his helicopter was “forced down” on “the superhighway of terror” by Afghan extremists. The facts? He was in a helicopter with two other senators when a snowstorm closed in and the pilot decided to put down, after which a U.S. troop convoy took them to Bagram Airfield in Afghanistan. Biden’s shifting versions of events continue today. In 2012, Biden said he advised President Obama not to approve the raid on the Abbottabad, Pakistan compound that resulted in the killing of Osama bin Laden. White House spokesman Jay Carney confirmed Biden’s comment. But on Oct. 20, Biden said just the opposite, that he had he privately advised Obama to approve the raid. And let’s not forget Biden was perfectly willing to embrace and propagate the administration’s lie that the Benghazi terrorist attack that resulted in the death of American ambassador was a spontaneous reaction to an inflammatory anti-Muslim video. 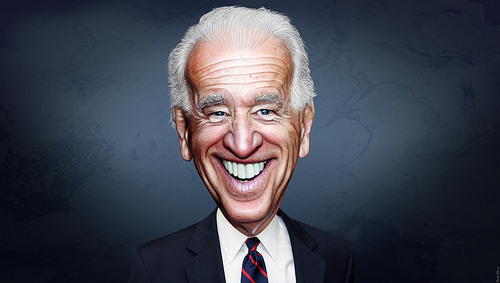 Then, of course, there’s Biden’s seemingly never ending dithering on whether to enter the race for the Democratic Party’s presidential nomination. His hemming and hawing and general indecisiveness on that issue alone should tell you a lot about his suitability for the presidency. When Biden dropped out of the selection process this time around, Hillary Clinton said she’s confident that “history isn’t finished with Joe Biden.” Let’s hope not, at least insofar as historical truth goes. This entry was tagged abbottabad, Afghanistan, Bagram Airfield, Benghazi, Bosnia, Clarence Thomas, Hillary Clinton, History isn't finished with Joe Biden, Joe Biden, Landmark Legal Foundation, Mark Levin, Neil Kinnock, Osama Bin Laden, plagiarism, Robert Bork, Syracuse Law School. Bookmark the permalink.